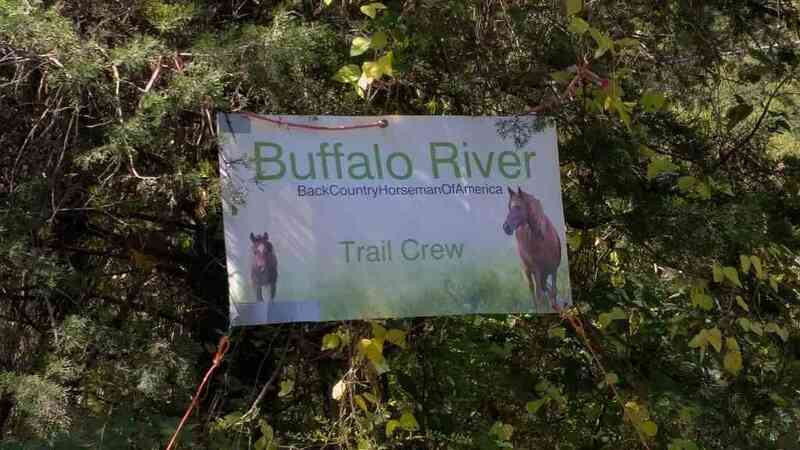 The Buffalo River Chapter Back Country Horsemen (BRCBCHA) is a local chapter of the Back Country Horsemen of America (BCHA), a non-profit service organization dedicated to keeping trails open to everyone on our public lands and to protecting our heritage of responsible equine use in the back country. The Buffalo River Chapter Back Country Horsemen is one of three local chapters in Arkansas, and we are supported in our efforts by the Arkansas Back Country Horsemen of America, our state organization. 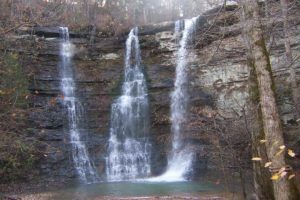 Our chapter’s primary focus is the upper section of the beautiful Buffalo National River and its watershed in northwest Arkansas where we regularly meet to clear and maintain trails. This section includes portions of the Upper Buffalo Wilderness, the Ponca Wilderness, and the river trails from Boxley to Mt. Hersey. We, also, have members throughout the state who work to develop and maintain trails in our national forests, state parks and wildlife management areas. We are committed to being good stewards of America’s first National River, and we feel fortunate to be riding and working on some of the most beautiful trails in the country. BRCBCHA is part of the local “boots on the ground” work force that puts our national mission statement into action; BCHA gives us wings by advocating for horsemen’s rights at the national level. Founded in 1973 by a dedicated group of horsemen who were determined to protect and promote the sustainable use of stock in the back country, BCHA is now the leading national advocate of private recreational stock use on all public lands and stewardship of those lands. When you join BRCBCHA, you speak with a voice that is more than 13,000 members strong, ensuring that your concerns will be heard. As a member, you can be sure that you have a seat at the table when there are public debates about the future of horses and mules on our trails. 1. To promote the common sense use and enjoyment of horses in America’s back country and wilderness. 3. To assist the various government and private agencies in their maintenance and management of said resources. 5. To foster and encourage the formation of new state (and local) Back Country Horsemen’s organizations. Buffalo River Chapter BCHA is a service organization. Through regularly scheduled work days, our members strive to put our mission into action. 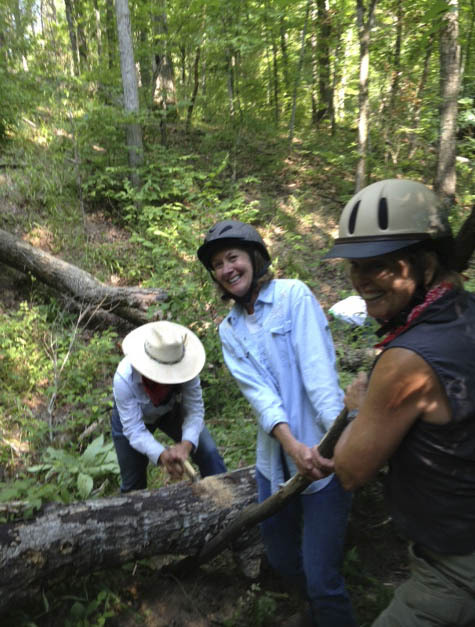 We work to keep trails open to everyone by clearing brush and deadfall, pruning low-hanging branches, picking up trash, placing water bars to help control erosion, and helping to maintain horse camps. Some of our work involves “horsepower” as our four-legged friends assist national park crews in hauling logs and other trail maintenance equipment into wilderness areas where vehicles and power tools are not permitted. Because of these restrictions meant to protect wilderness areas, we work primarily with hand tools, including hand saws, clippers and loppers, and it’s unusual to see our members riding without these tools of the trade – even when they are out for a purely recreational ride. As the Buffalo River Chapter Back Country Horsemen, we are privileged to ride and work on America’s first National River, the Buffalo National River. Flowing from its headwaters high in the Boston Mountains, this stunning river flows freely nearly 150 miles before emptying into the White River near Buffalo City. It encompasses almost 96,000 acres of rugged mountain terrain, massive limestone bluffs, deep hollows, and lush, gently rolling valleys. In order to protect the pristine quality of the river and to preserve it as a free-flowing stream, Congress declared it as our nation’s first national river in 1972 and placed it under the protection of the National Park Service. Today it remains one of the few undamed rivers in the lower 48 states, and it provides many of us with our finest hours. With the addition of two new chapters in 2017, Buffalo River Chapter BCHA is now able to concentrate its efforts in the upper Buffalo River, from the Boxley area to Mt. Hersey. In order to help protect this national treasure and maintain its trail system, members of BRCBCHA coordinate with the Buffalo River National Park through a special Memorandum of Understanding that outlines our working relationship with the Park. This agency values our support, as its maintenance and trail budgets have been reduced over the last several years. In 2018 alone, BRCBCHA contributed more than 1143 volunteer hours to the Buffalo National Park and its surrounding areas. Members also volunteered their time in the Ouachita Mountains, the Ozark National Forest, six Wilderness Areas, and several Wildlife Management Areas maintained by Arkansas Game and Fish Commission. Because one of our important missions is educating horsemen in the wise use of back country resources, BRCBCHA has provided classes in CPR and first aid, packing with stock, and in Leave No Trace principles. Our membership includes Leave No Trace trainers who regularly share their knowledge of treading lightly in the back country. Several of our members have trained and participated in Wilderness Search and Rescue, providing a life-saving resource. As a group we also participate in an annual Youth Horse Camp Weekend that promotes riding, packing and camping skills, all while having a lot of fun! New members are welcome at any time. Click on Join Us for more information. If you would like to know more about the Buffalo National River, please visit nps.gov.